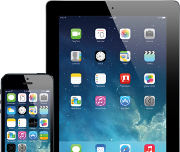 Technology is eliminating grunt work and boosting the value of financial planning and analysis. For those involved in financial planning and analysis, the bad news is that the work can be boring much of the time. The good news: It’s quickly getting more interesting. 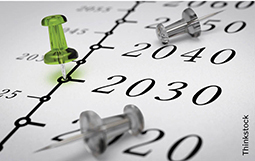 As with many corporate processes, technology is driving fundamental changes in FP&A. Thanks to a new generation of tools, the drudgery factor is lessening and practitioners are spending more of their time doing actual planning and analysis. And that’s a fortunate development, not just for FP&A professionals, but also for the companies they work for. In almost every industry, today’s souped-up business environment drives a concomitant need for heightened strategic input. FP&A encompasses a plethora of strategic activities, from budgeting and forecasting to management reporting, business-decision guidance, and specialized tasks in areas like risk management. Unfortunately, as much of 70% of the work still consists of acquiring, verifying, and reconciling data, according to Brian Kalish, an FP&A consultant. For example, new FP&A tools allow CFOs to produce what-if balance sheets for multiple scenarios so they can anticipate 6 to 12 months out whether they might miss benchmarks required by debt covenants, says Alan Hart, principal consultant with Pacific Shine Group. But the new automation also goes far beyond that. A few years back, many companies, especially large global ones, were increasingly outsourcing transactional FP&A functions. Now those tasks are more often handled with new planning and analysis software that can do the work less expensively and more accurately, notes Punit Bhatia, a Deloitte partner and leader of its business process outsourcing (BPO) practice. Some Deloitte clients are even finding that the latest FP&A technology can produce more-accurate forecasts than their business-unit managers can, Bhatia says. Indeed, he notes, outsourcing providers are cannibalizing their own businesses by offering their clients robotics software and the related services for setting it up, keeping it going, and jumping in to handle exceptions that the robots can’t. BPO firms traditionally have had human capital–centric service models, but today they have no choice but to raise their games with automation, as that’s what companies are looking for. The argument for outsourcing now is that a BPO firm may provide a service for hundreds of companies and also have the latest technologies. Therefore, it may be more efficient than a single company can be, Bhatia says. But companies are unlikely to outsource their most strategically important planning activities and analyses. “It’s quite rare for a client to say, ‘I’m going to try outsourcing for the first time, and go with FP&A as the first wave.’ They’ll try it with the more transactional stuff first,” Bhatia notes. For those lower-level tasks that generate the data needed for planning and analysis work, many CFOs and business-unit finance leaders at large companies prefer to tap their internal shared-services organizations. In that scenario, finance has more control over the work and can more easily intervene to fix problems. The big three software vendors in the enterprise planning space—Oracle, SAP, and IBM—have been steadily pumping out new FP&A tools for a few years, as have assorted smaller vendors. Much of this automation is cloud-based and affordable. There’s a night-and-day difference between the FP&A technology available today and that of a few years ago, agrees Gary Rihani, CFO of Lakeview Cheese, a processor and distributor with $100 million in annual revenue. Rihani is researching enterprise resource planning (ERP) systems, something he also did for his previous employer, Ace Metal Crafts, which completed an ERP installation in 2014. The FP&A options available in new ERP systems are much more robust and easy to navigate, and the interfaces are more user-friendly and attractive, Rihani notes. “The functionality was there before,” he says, “but it would take a lot longer to get where you wanted to go than it does now.” Rihani expects the improved tools to help him pull up operating figures on a daily or real-time basis to better identify bottlenecks in production or spot cost issues. If a task can be moved out of FP&A — to automation, to an outsourcing provider, or to another unit within the company — then it probably shouldn’t be considered an FP&A function, according to Kalish. For the most part, that includes any task associated with closing the books, reconciling transactions between business units, or dealing with budget variances. CFOs should also make sure that generating reports is well down the hierarchy of tasks for FP&A, which better serves the company as a provider of analysis. A drawback of the new tools is that they foster the ability to report information a thousand different ways, and they create a temptation to run reports that demonstrate that ability, notes Kalish. Steve Larek, CFO for Clare Holdings, recently implemented a new ERP system for one of the company’s businesses, a Chicago-based beer distributorship. A key issue was making sure the finance staff was up to speed on the skills and competencies needed to use the system’s FP&A tools—but he then found that he had to restrain them from overusing their new analytical capabilities. Specifically, he says, he pushed for the team to understand that achieving 98% accuracy within an hour is far more valuable than achieving 100% accuracy within a day or two. The training effort paid off in the aftermath of the two huge September hurricanes, Irma and Maria, that devastated the region. The team pulled together a new consolidated forecast for the business through year-end in two-and-a-half days, which Larek says astounded the company’s bankers. 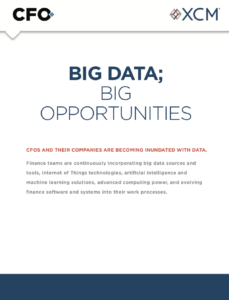 In the future, CFOs should expect to find more FP&A applications that take better advantage of the massive amounts of virtually free data that have become available from many sources, Kalish says. It wasn’t long ago, he points out, that crunching big data was either physically impossible — finance couldn’t get the information — or prohibitively expensive. Finance chiefs should also look for applications with machine-learning capabilities—where the software gets “smarter” as it observes humans operating it—and even artificial intelligence features. FP&A software vendors are also likely to provide more specific tools that fit the needs of individual companies and that will integrate with other finance systems and software. Keith Button is a freelance writer based in Valley Cottage, New York. 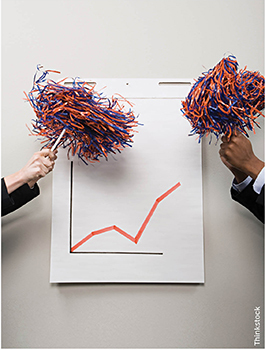 Take the ‘F’ Out of FP&A? A purely financial focus leads to damaging short-termism, KPMG says. 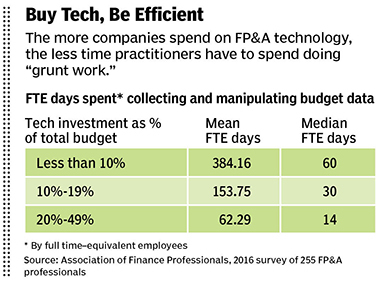 Try this on for size: Companies shouldn’t even be involved in FP&A. So says KPMG Advisory, which argues in a September report that FP&A should be replaced with BP&A—“business planning and analysis.” The idea is to downplay finance’s focus on short-term results and shift toward strategies aimed at a longer-run future. In contrast, “a business planning approach incorporates activities from functions that are crucial to moving the business forward —such as sales, marketing, and operational planning — all aligned with the company’s strategic vision.” Rather than targeting a pure financial valuation, the company integrates key functional areas that directly influence business results. That mindset can lead to many challenges, like business leaders making short-term decisions so the numbers work temporarily but in the process creating bigger long-term problems.